A I think Hearts have suffered enough last-day grief without 58-59 being added to their losses. That season Rangers were actually six points ahead with two to play. Hearts had three to play. There wasn't much in the goal average so Hearts had to win all three while Rangers lost both in order to win the league. Hearts beat Rangers then won their game in hand at Pittodrie to reduce the gap to two points with a game left. Goal averages were then absolutely identical. But while Rangers lost at home to Aberdeen in their final match, Celtic beat Hearts at Parkhead (thus confounding all the conspiracy theorists). So while the title went to the wire it was Rangers' to lose. Instances of a side losing the flag when their fate was THEIR OWN to determine (other than those famous/infamous occasions in 1965 and 1986 when Hearts failed to hang on) include Dundee in 1949 who lost at Falkirk while Rangers beat Albion Rovers to win the league and Aberdeen in 1991 who lost at Ibrox, handing the title to Rangers, when a draw would have won the championship. There have been occasions when a side has led the league going into their final game and finished second but the situation was OUT of their control. The Rangers v Aberdeen game in 1968 you mention wasn't quite like that. Rangers had led for much of the season and were unbeaten in the league yet Celtic were top on goal average at the time of this fixture. Had Rangers won that day then a Celtic victory at Dunfermline in their final game four days later would still have won Celtic the league. Rangers' defeat meant Celtic simply had to avoid a sixteen-goal defeat. There was a similar instance three years later. Aberdeen led going into their last match. They were three points ahead of Celtic who had three to play. A Dons victory would have required Celtic to win all their remaining games or take five out of six points at least. But Aberdeen lost at Falkirk. Celtic started their games in hand with a draw at Love Street then a home victory over Ayr United. That left them needing a point from their final game at home to Clyde which they won 6-1. In 1980 Celtic led going into their last match but their fate was not in their own hands. They were a point ahead of Aberdeen who had two matches left. A 0-0 draw for Celtic at St Mirren coupled with a 5-0 Dons victory at Easter Road meant Aberdeen needed only to avoid a ten-goal defeat in their final match at Firhill to win the flag. They drew the game to win by a point. As a Hearts fan you'll be delighted to know Hibs were top when they won their final game in 1953 but lost out to Rangers who needed three points from their two remaining fixtures to win on goal average and did precisely that. Had goal difference applied Hibs would have won the title by a single goal. Three years before that Hibs went to Ibrox in their last match ahead of Rangers on goal average but with the Gers having played one match fewer. Even a one-goal victory for Hibs would have left Rangers needing to win their last game by eight goals to overtake them. In the event it was a 0-0 draw and Rangers ended their programme two days later with a 2-2 draw away to Third Lanark to win the title by a point. The nearest I can find to Celtic blowing it on the last day with their fate in their own hands prior to 2005 was over a century ago. On New Year's Day 1902 they played their final game of the season at home against Rangers. They were four clear of Hearts (who had finished their programme) and six ahead of Rangers who had four to play. A draw meant Rangers needed to win all their remaining matches to make it a tie. A Celtic win and the league was theirs. Rangers won 4-2 and went on to win their remaining games to take the title by two points. But the championship wasn't theirs until March 29th then they beat Dundee 3-1 at Ibrox. So while Celtic definitely lost the chance to secure the trophy in their last game it was nearly three months later before they were overhauled so it wouldn't be fair to say they lost the league in either their last match or on the last day. In 1905 the Old Firm finished level on points and Celtic won a play-off. Either goal average or goal difference would have seen Rangers champions. The key game before the play-off was Celtic's second last which they won 4-1 at Ibrox. Had they lost that day the two teams would have been level on points with Rangers having two games in hand. Motherwell also featured in Celtic's failure to win the title in 1918 but again it wasn't in their own hands. The Old Firm were locked together on 54 points when Celtic drew their last match at home to 'Well. Rangers beat Clyde at Ibrox the same day to win by a point. A I actually attended a league match at Rugby Park in October 1968 when Kilmarnock came back from 4-0 down at half-time to draw 4-4 with Raith Rovers. After consulting my colleague Forrest Robertson we both reckon the biggest comeback in a domestic game was Queen's Park v Kilmarnock in a First Division match on December 15th 1900. Killie were 5-0 up at half-time and almost made it six. Ten minutes of the second half had been played before the Spiders reduced the leeway. A minute later the famous RS McColl scored a second for the home side. Then came an incredible spell when Queen's scored three times in two minutes - the second of which was from a gem of a solo run by McColl - to level the game at 5-5. A The very first Celtic strip was a white jersey with a green collar and a green Celtic cross on a red background on the left breast. The illustration here shows the cross on the right breast. This is believed to be a reproduction error. 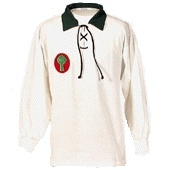 They also played in green-and-white stripes before eventually changing to hoops in 1903-04. A Eddie Gilfeather signed for Celtic from Cowdenbeath in 1922 but made just two first team appearances - both in the league - in 1925-26. He didn't score in either game. He moved on to Hibernian in 1926 and was a regular there for several seasons. A Annbank-born Jimmy Gourlay was the son of a former Scotland international of the same name. Jimmy Jr's first club was Port Glasgow Athletic (then a First Division side). He made 22 league appearances in 1908-09, scoring six times. He joined Everton in 1909 and made 54 league appearances there in total, scoring eight times. He also played four times in the FA Cup and scored once. He was transferred to Morton in 1913. First World War players' records are patchy to say the least but he certainly made over 320 - and probably between 350-370 - league appearances for Morton between 1913-26, scoring at least 86 goals. Of the five goals he scored in the Scottish Cup for Morton the most important was undoubtedly the only goal of the game in the 1922 Final v Rangers. George French joined Morton after the end of the war and made 182 top-flight league appearances, scoring 112 goals mostly during the era when there had to be THREE defenders between the forward and the goal in order to be onside. He scored seventeen times in the Scottish Cup, including two hat-tricks, but missed the 1922 Final through injury. Jackie Wright joined up at Cappielow in 1911 so, like Gourlay, the stats are incomplete. He made a similar number of league appearances as Gourlay - in excess of 320 and possibly as many as 390 between 1911-1924, scoring at least sixteen goals. None of his goals were in the Scottish Cup.